This week’s New York Times Magazine features a piece by reporter Carlotta Gall called “What Pakistan Knew About Bin Laden.” As the title suggests, it explores ties between Pakistan’s intelligence agency, the ISI, and the Taliban, and claims that senior Pakistani officials, including former President President Pervez Musharraf, probably were aware of Osama bin Laden’s presence in Abbottabad, the Pakistani city where he was discovered and killed in 2011. 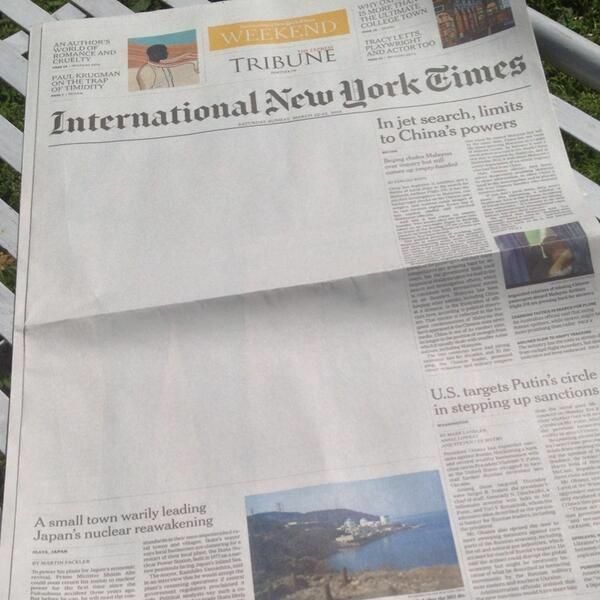 But it seems that some people in Pakistan didn’t want the public reading about all that, because the 4,800-word article, which appeared on the front page of the International New York Times in other countries, completely disappeared from editions of the paper in Pakistan. As you can see from the photo posted to Twitter by BBC reporter Aleem Maqbool (and Gall herself, along with others), the censors didn’t do a very elegant job. Times spokesperson Eileen Murphy confirmed to Bloomberg that their printer in Pakistan, which is part of the Express Tribune newspaper there, removed the story without the Times’ knowledge or consent. “We would never self-censor and this decision was made without our knowledge or agreement,” she said in an email. “While we understand that our publishing partners are sometimes faced with local pressures, we regret any censorship of our journalism.” Murphy didn’t say whether the Times planned to continue working with the printer.